Whether you run a restaurant or a college cafeteria, your commercial refrigeration units run 24/7 and form the foundation of your business. As soon as they start to struggle with efficiency, you can lose out on both energy bills and spoiled produce. Nobody needs that. At Frontier A/C, our elite NATE certifications qualify us to work with large-scale refrigeration systems, and we’re here to help you. You can’t afford to have your refrigerators shutting down or performing poorly. However, if you don’t invest in regular maintenance, you’re putting your entire operation at risk — turn to our professional maintenance services. 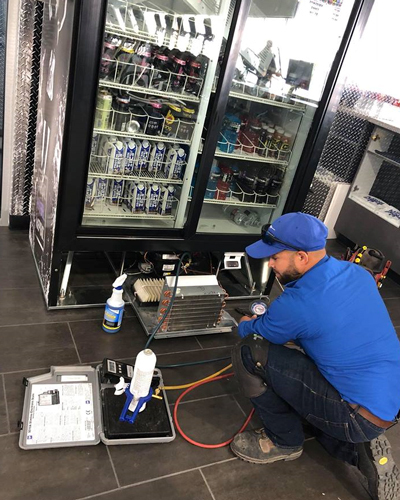 We’ll keep a finger on the pulse of your refrigeration equipment, identifying potential issues before they can become serious and ensuring that your system is functioning at its best. When you know your refrigerators are being cared for, it’s possible to focus on more exciting things, like growing your business! The whole Frontier A/C team is here to be your ally, keeping your foundations secure so you can pursue your vision for your business. We’ll always put your interests first and go the extra mile to ensure that you are well taken care of. Contact us to learn more today.